In this project we have developed a numerical method for two-phase flow with insoluble surfactants and contact line dynamics in two dimensions. The flow behavior of many multiphase flow applications is greatly influenced by wetting properties and the presence of surfactants. We have developed a numerical method for two-phase flow with insoluble surfactants and contact line dynamics in two dimensions. The method is based on decomposing the interface between two fluids into segments, which are explicitly represented on a local Eulerian grid. It provides a natural framework for treating the surfactant concentration equation, which is solved locally on each segment. An accurate numerical method for the coupled interface/surfactant system is given. 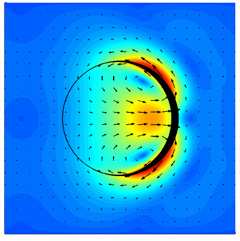 The system is coupled to the Navier-Stokes equations through the Immersed Boundary Method.